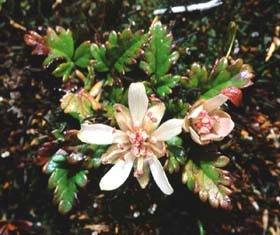 Rubus gunnianus (Native Strawberry) is a common herb in the alpine and subalpine areas of Tasmania. The leaves often have three toothed leaflets arranged in rosettes connected by wiry stems running just below the surface of the ground. 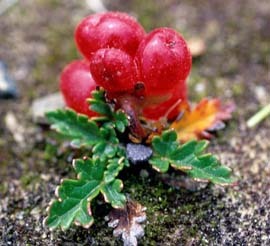 The red, raspberry-like fruit are edible.